We just learned about the Canadian province of Saskatchewan. Another Canadian province is Nova Scotia which means "New Scotland". This is an island province on the east coast of Canada, right on the ocean. The flag of Nova Scotia is a white flag with a blue cross on it. This is supposed to look like the flag of Scotland, which is a blue flag with a white cross on it. In the middle of the Nova Scotia flag is a gold shield with a red lion, which is the royal arms of Scotland. The coat of arms of Nova Scotia has two hands on it that are shaking hands, one of the hands has a metal gauntlet. Part of Nova Scotia's history was making peace with the Native Mi'Kmaq people that lived there. By the hands are leaves from a thistle and a laurel, meaning strong defense but also peace. The coat of arms also has the province flag, a unicorn for Scotland, and a Mi'kmaq First Nation native. The motto is "Munit haec et altera vincit" which means "One hand defends and the other conquers"
Because it is an island province, fishing is one of the most important jobs there, and they are one of the largest catcher of lobsters in the world. Cape Breton is a small island that is part of Nova Scotia. 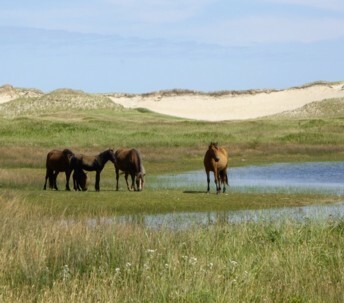 Sable Island is nother very small island in Nova Scotia, and it is only 150 miles long! On this island are about 500 wild horses, that just run free on the island where nobody lives.